Heat closed medium-size contact grill for 5 minutes. Pull each biscuit apart into 2 layers; press each into 5-inch round. Place 2 rounds at a time on grill; close grill. Cook about 1 minute or until light brown. 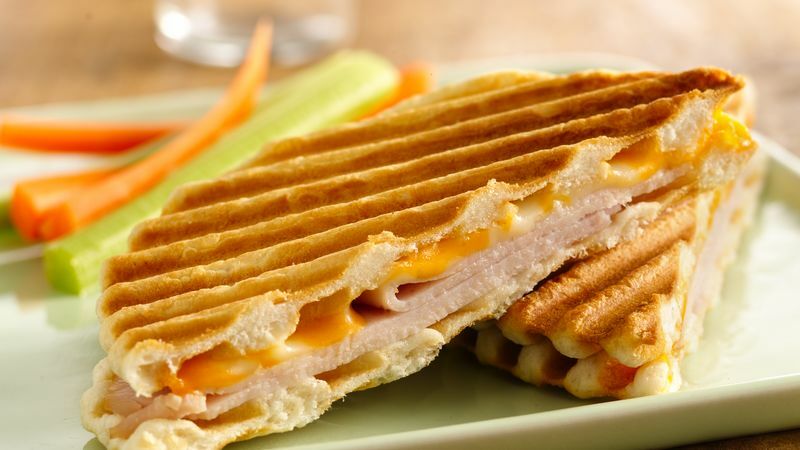 Remove from grill; layer turkey and cheese on 5 rounds. Top with remaining rounds. Place 2 at a time on grill; close grill. Cook 1 to 2 minutes or until cheese begins to melt. Contact grills are indoor-use grills that cook the food betwen two grids. Both top and bottom grids are heated so food is cooked from both sides quickly.